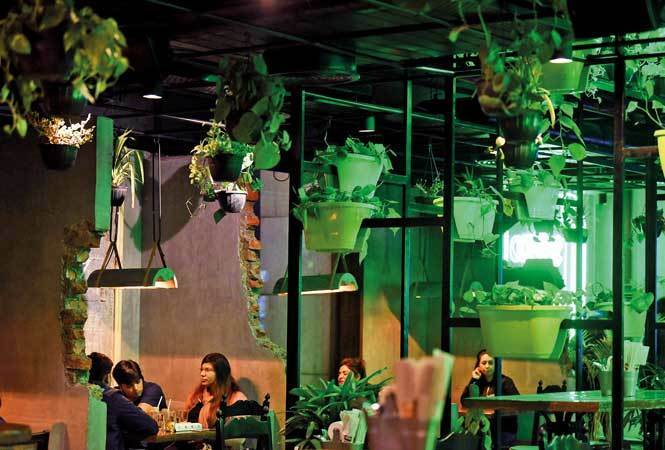 It is no coincidence that every new restaurant that’s coming up in NCR either has a green roof covered with real plants – pots suspended from the ceiling, creepers covering the wall, or a green area that boasts of seasonal plants. In a bid to provide fresh and better-quality air to the guests, restaurateurs are coming up with green spaces and including plants in their restaurants, both indoors and outdoors. After installing air purifiers, it is a yet another attempt by restaurateurs to provide their guests with some respite from Delhi’s polluted air. These green spaces are a mix of anti-pollution and seasonal plants. Some restaurateurs even grow herbs in their vicinity, which are used in their kitchen. Abhigyan Neogi, an interior decorator who has designed a number of restaurants in NCR, tell us that ‘the green, natural look’ has been in trend of late. “Such green spaces are not just aesthetically appealing, but they also attract the attention of the guests who take note of such details. Some restaurants, which do not have sunlight access, choose a certain area to be covered with natural plants and there are some which want to use different plants in the premises, in the same format as vertical gardens,” Neogi says. “Prankster at Sector 29 in Gurgaon has one wall completely covered with creepers, which is also a popular selfie point in the restaurant. I have recently designed a food court in one of the buildings in Aerocity and the entire area was designed like a lush green forest with natural plants,” says Neogi. However, not every restaurant chooses only anti-pollution plants. “The cost goes up if they decide to go with only anti-pollution indoor plants, since the area is usually huge. Most restaurants go with a mix of seasonal and anti-pollution plants,” adds Neogi. Since the concept of green restaurants is gaining popularity among diners, more restaurants are opening up to the idea of indoor gardens. 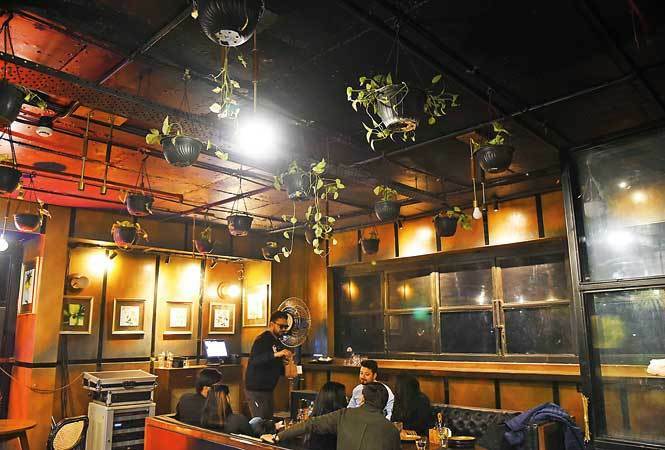 Amandeep Singh Arora, the owner of Gravity Spacebar in Gurgaon’s Sector 29, says that one floor of his restaurant has a ‘close to nature’ concept, with real plants covering the area. “Till a few years ago, people might have thought that these green spaces are just to switch up the decor, but now, when pollution in Delhi has made national news, guests appreciate the fact that they will be getting some fresh air when they eat. And since Diwali, that section of our restaurant is mostly reserved in advance. It is a huge hit with families and big groups,” says Arora. When restaurateur Dinesh Arora finalised where his first Gurgaon outlet of Unplugged Courtyard would be, he decided to retain over 15-20 trees that were a part of the location. “We designed the theme around these trees. Even the boundary of that seating area is covered with natural plants. We also have a special section called Secret Garden, and its rooftop and walls are covered with creepers,” says Dinesh. Among other outlets in NCR that are using natural plants as part of their decor are Social, Vasant Kunj, and Verandah Moonshine in Punjabi Bagh. The plants need regular care, and their maintenance is assigned to an expert. “We have a gardener who specializes in taking care of indoor gardens. He has to work on these plants for a few hours every morning. Some of these plants wither easily with a change on temperature and they need to be replaced immediately. Also, we have to ensure that there are no pests or any other insects around, so we have to keep the place clean and pest-free.” says Nneeraj. Satyajit Dhingra, Head of Operations, Social Vasant Kunj, says that they decided to have natural plants in their premises after trying the same at some of their outlets in Mumbai and Bengaluru. “These plants require sunlight and therefore we have them in our outlets that get direct sunlight. The outlet at Vasant Kunj is on the third floor of a mall, and we get very good sunlight there. We have all these natural plants indoors, and there is also a small, enclosed area on the roof for bigger plants,” says Satyajit.